We strongly recommend that you read Planning for an Azure Files deployment and Planning for an Azure File Sync deployment before you complete the steps described in this article. Region availability for Azure File Sync. Create a storage account for a step-by-step description of how to create a storage account. Create a file share for a step-by-step description of how to create a file share. At least one supported instance of Windows Server or Windows Server cluster to sync with Azure File Sync. For more information about supported versions of Windows Server, see Interoperability with Windows Server. If your PSVersion value is less than 5.1. *, as will be the case with most fresh installations of Windows Server 2012 R2, you can easily upgrade by downloading and installing Windows Management Framework (WMF) 5.1. The appropriate package to download and install for Windows Server 2012 R2 is Win8.1AndW2K12R2-KB*******-x64.msu. Azure File Sync does not yet support PowerShell 6+ on either Windows Server 2012 R2 or Windows Server 2016. The Az and the AzureRM PowerShell modules. The Az module can be installed by following the instructions here: Install and configure Azure PowerShell. For each server that you intend to use with Azure File Sync, including each server node in a Failover Cluster, disable Internet Explorer Enhanced Security Configuration. This is required only for initial server registration. You can re-enable it after the server has been registered. 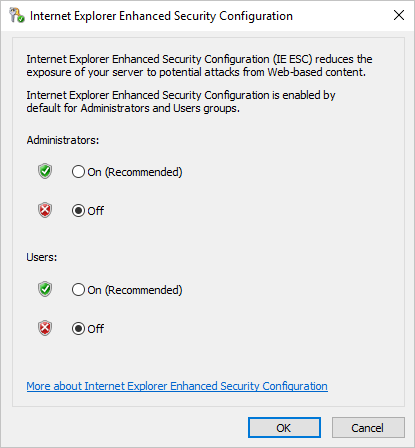 On the Properties subpane, select the link for IE Enhanced Security Configuration. # Force Internet Explorer closed, if open. This is required to fully apply the setting. The deployment of Azure File Sync starts with placing a Storage Sync Service resource into a resource group of your selected subscription. We recommend provisioning as few of these as needed. You will create a trust relationship between your servers and this resource and a server can only be registered to one Storage Sync Service. As a result, it is recommended to deploy as many storage sync services as you need to separate groups of servers. Keep in mind that servers from different storage sync services cannot sync with each other. The Storage Sync Service inherited access permissions from the subscription and resource group it has been deployed into. We recommend that you carefully check who has access to it. Entities with write access can start syncing new sets of files from servers registered to this storage sync service and cause data to flow to Azure storage that is accessible to them. To deploy a Storage Sync Service, go to the Azure portal, click Create a resource and then search for Azure File Sync. In the search results, select Azure File Sync, and then select Create to open the Deploy Storage Sync tab. Name: A unique name (per subscription) for the Storage Sync Service. Subscription: The subscription in which you want to create the Storage Sync Service. Depending on your organization's configuration strategy, you might have access to one or more subscriptions. An Azure subscription is the most basic container for billing for each cloud service (such as Azure Files). Location: The region in which you want to deploy Azure File Sync. Only supported regions are available in this list. When you are finished, select Create to deploy the Storage Sync Service. Before interacting with the Azure File Sync management cmdlets, you will need to import a DLL and create an Azure File Sync management context. This is required because the Azure File Sync management cmdlets are not yet part of the Azure PowerShell modules. The StorageSync.Management.PowerShell.Cmdlets.dll package, which contains the Azure File Sync management cmdlets, (intentionally) contains a cmdlet with an unapproved verb (Login). The name Login-AzureStorageSync was chosen to match the Login-AzAccount cmdlet alias in the Azure PowerShell module. This error message (and cmdlet) will be removed when the Azure File Sync agent is added to the Azure PowerShell module. # agent to a non-standard location, please update this path. Once you have created the Azure File Sync context with the Login-AzureRmStorageSync cmdlet, you can create the Storage Sync Service. Be sure to replace <my-storage-sync-service> with the desired name of your Storage Sync Service. The Azure File Sync agent is a downloadable package that enables Windows Server to be synced with an Azure file share. You can download the agent from the Microsoft Download Center. When the download is finished, double-click the MSI package to start the Azure File Sync agent installation. If you intend to use Azure File Sync with a Failover Cluster, the Azure File Sync agent must be installed on every node in the cluster. Each node in the cluster must registered to work with Azure File Sync. Leave the default installation path (C:\Program Files\Azure\StorageSyncAgent), to simplify troubleshooting and server maintenance. Enable Microsoft Update to keep Azure File Sync up to date. All updates, to the Azure File Sync agent, including feature updates and hotfixes, occur from Microsoft Update. We recommend installing the latest update to Azure File Sync. For more information, see Azure File Sync update policy. When the Azure File Sync agent installation is finished, the Server Registration UI automatically opens. 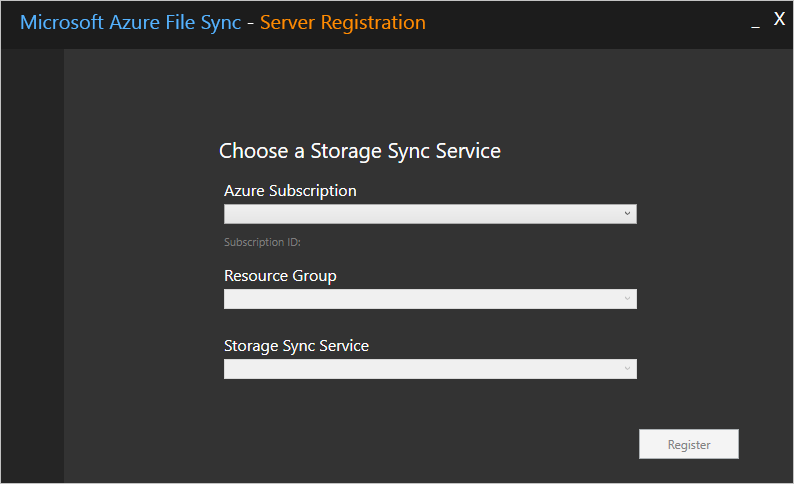 You must have a Storage Sync Service before registering; see the next section on how to create a Storage Sync Service. Execute the following PowerShell code to download the appropriate version of the Azure File Sync agent for your OS and install it on your system. # Download the appropriate version of the Azure File Sync agent for your OS. # Install the MSI. Start-Process is used to PowerShell blocks until the operation is complete. 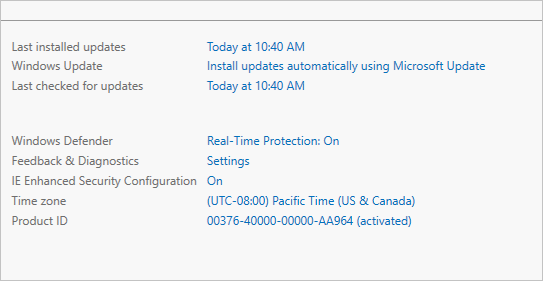 # Note that the installer currently forces all PowerShell sessions closed - this is a known issue. # Note that this cmdlet will need to be run in a new session based on the above comment. Registering your Windows Server with a Storage Sync Service establishes a trust relationship between your server (or cluster) and the Storage Sync Service. A server can only be registered to one Storage Sync Service and can sync with other servers and Azure file shares associated with the same Storage Sync Service. Server registration uses your Azure credentials to create a trust relationship between the Storage Sync Service and your Windows Server, however subsequently the server creates and uses its own identity that is valid as long as the server stays registered and the current Shared Access Signature token (Storage SAS) is valid. A new SAS token cannot be issued to the server once the server is unregistered, thus removing the server's ability to access your Azure file shares, stopping any sync. The Server Registration UI should open automatically after installation of the Azure File Sync agent. If it doesn't, you can open it manually from its file location: C:\Program Files\Azure\StorageSyncAgent\ServerRegistration.exe. When the Server Registration UI opens, select Sign-in to begin. Azure Subscription: The subscription that contains the Storage Sync Service (see Deploy the Storage Sync Service). Resource Group: The resource group that contains the Storage Sync Service. Storage Sync Service: The name of the Storage Sync Service with which you want to register. After you have selected the appropriate information, select Register to complete the server registration. As part of the registration process, you are prompted for an additional sign-in. A sync group defines the sync topology for a set of files. Endpoints within a sync group are kept in sync with each other. A sync group must contain one cloud endpoint, which represents an Azure file share and one or more server endpoints. A server endpoint represents a path on registered server. A server can have server endpoints in multiple sync groups. You can create as many sync groups as you need to appropriately describe your desired sync topology. A cloud endpoint is a pointer to an Azure file share. All server endpoints will sync with a cloud endpoint, making the cloud endpoint the hub. The storage account for the Azure file share must be located in the same region as the Storage Sync Service. The entirety of the Azure file share will be synced, with one exception: A special folder, comparable to the hidden "System Volume Information" folder on an NTFS volume, will be provisioned. This directory is called ".SystemShareInformation". It contains important sync metadata that will not sync to other endpoints. Do not use or delete it! You can make changes to any cloud endpoint or server endpoint in the sync group and have your files synced to the other endpoints in the sync group. If you make a change to the cloud endpoint (Azure file share) directly, changes first need to be discovered by an Azure File Sync change detection job. A change detection job is initiated for a cloud endpoint only once every 24 hours. For more information, see Azure Files frequently asked questions. Subscription: The subscription where you deployed the Storage Sync Service in Deploy the Storage Sync Service. To create the sync group, execute the following PowerShell. Remember to replace <my-sync-group> with the desired name of the sync group. Once the sync group has been successfully created, you can create your cloud endpoint. Be sure to replace <my-storage-account> and <my-file-share> with the expected values. A server endpoint represents a specific location on a registered server, such as a folder on a server volume. A server endpoint must be a path on a registered server (rather than a mounted share), and to use cloud tiering, the path must be on a non-system volume. Network attached storage (NAS) is not supported. To add a server endpoint, go to the newly created sync group and then select Add server endpoint. Registered server: The name of the server or cluster where you want to create the server endpoint. Path: The Windows Server path to be synced as part of the sync group. Cloud Tiering: A switch to enable or disable cloud tiering. With cloud tiering, infrequently used or accessed files can be tiered to Azure Files. Volume Free Space: The amount of free space to reserve on the volume on which the server endpoint is located. For example, if volume free space is set to 50% on a volume that has a single server endpoint, roughly half the amount of data is tiered to Azure Files. Regardless of whether cloud tiering is enabled, your Azure file share always has a complete copy of the data in the sync group. To add the server endpoint, select Create. Your files are now kept in sync across your Azure file share and Windows Server. Execute the following PowerShell commands to create the server endpoint, and be sure to replace <your-server-endpoint-path> and <your-volume-free-space> with the desired values. Deploy a Storage Sync Service. Install Azure File Sync agent on the server with the full data set. Register that server and create a server endpoint on the share. Let sync do the full upload to the Azure file share (cloud endpoint). After the initial upload is complete, install Azure File Sync agent on each of the remaining servers. Create new file shares on each of the remaining servers. Let Azure File Sync agent to do a rapid restore of the full namespace without the actual data transfer. After the full namespace sync, sync engine will fill the local disk space based on the cloud tiering policy for the server endpoint. Ensure sync completes and test your topology as desired. Redirect users and applications to this new share. You can optionally delete any duplicate shares on the servers. If you don't have extra storage for initial onboarding and would like to attach to the existing shares, you can pre-seed the data in the Azure files shares. This approach is suggested, if and only if you can accept downtime and absolutely guarantee no data changes on the server shares during the initial onboarding process. Ensure that data on any of the server can't change during the onboarding process. Pre-seed Azure file shares with the server data using any data transfer tool over the SMB e.g. Robocopy, direct SMB copy. Since AzCopy does not upload data over the SMB so it can't be used for pre-seeding. Create Azure File Sync topology with the desired server endpoints pointing to the existing shares. Let sync finish reconciliation process on all endpoints. Once reconciliation is complete, you can open shares for changes. Full fidelity on files is not preserved. For example, files lose ACLs and timestamps. Data changes on the server before sync topology is fully up and running can cause conflicts on the server endpoints. After the cloud endpoint is created, Azure File Sync runs a process to detect the files in the cloud before starting the initial sync. The time taken to complete this process varies depending on the various factors like network speed, available bandwidth, and number of files and folders. For the rough estimation in the preview release, detection process runs approximately at 10 files/sec. Hence, even if pre-seeding runs fast, the overall time to get a fully running system may be significantly longer when data is pre-seeded in the cloud. Create a sync group to represent the DFS-R topology you are replacing. Start on the server that has the full set of data in your DFS-R topology to migrate. Install Azure File Sync on that server. Register that server and create a server endpoint for the first server to be migrated. Do not enable cloud tiering. Let all of the data sync to your Azure file share (cloud endpoint). Install and register the Azure File Sync agent on each of the remaining DFS-R servers. Create a server endpoint on each of the DFS-R servers. Do not enable cloud tiering. Cloud tiering may now be enabled on any server endpoint as desired. For more information, see Azure File Sync interop with Distributed File System (DFS).